In the world of sartorial style there are few questions which inspire more rigorous debate than “Can sneakers be worn with suits?” During my early dips into the sartorial pond I would’ve responded “Are you serious bro?”. But this tadpole has matured with age (or so he hopes). Sneakers and suits couldn’t be more different: the former an item of footwear that is rooted in sporting history and youth rebellion; the latter the uniform of industrial modernity and therefore an emblem of the bourgeois status quo. 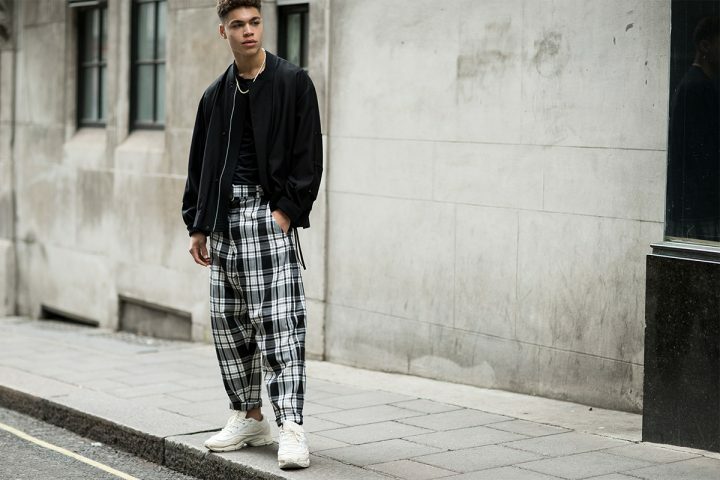 Furthermore sneakers are generally visually disruptive statement pieces, which prima facie, undermine the svelte appearance of a classic suit if worn together. White Walkers climb The Wall of Pitti. However despite these historical and aesthetic tensions, I believe that there’s always a way to get something to work as long as the principles of harmony and balance are respected (but I draw the line at Crocs). Minimalist sneakers, for example, lack extraneous detailing and possess a streamlined appearance that can be successfully integrated into a classic suiting ensemble. Leather specimens offered by legendary classic shoemakers Church’s and John Lobb, with their subtly pronounced insteps, smaller soles and shapes that recall the lasts of classic shoes are just as attractive kissing a tailored cuff as a pair of oxfords or brogues. Though the option is unconventional and will probably give grandpa a heart attack, the visual balance that they sustain won’t go unappreciated by the discerning few. The John Lobb Venton. Notice how the elegant sweep of the vamp recalls the longwings on a classic pair of brogues. Indeed even less-refined minimalist sneakers can be worn with suits if an edgier aesthetic is coveted. 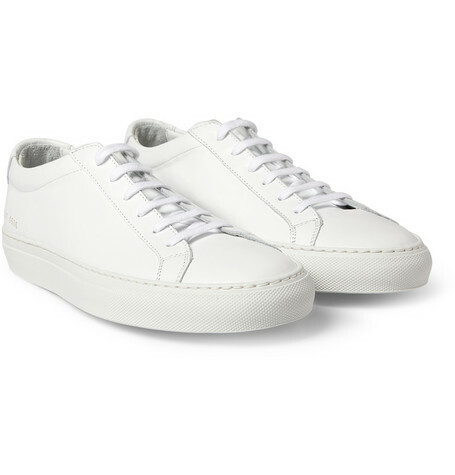 One-piece leather low-tops like Common Project’s Achilles Low with their iconic non-descript silhouette and careful attention to balance and proportions, can add a touch of visual complexity to a suit ensemble by remaining true to the spirit of understatement. Despite their streetwear and skate culture influences, the shoe’s elegant lines, perfect proportions and Nappa leather uppers overcome these obstacles. I imagine that only the most parochial traditionalist will object to them (and maybe their price tag as well). Common Project’s Achilles Low : The minimalist sneaker par excellence. But despite recommending minimalistic sneakers as the first port of call, it is not impossible to marry classic sneakers such as high-tops, canvas plimsolls or Adidas Stan Smiths with classic suiting. Doing so however does complicate things. This shouldn’t be surprising since their extroverted detailing, open lacing, and bulkier body, produces an appearance that is less refined than dress shoes. Obviously they were never intended to be worn underneath the sober cuff of a dark worsted suit. Indeed classic sneakers are best coupled with less structured suits as they are better equipped to handle the concomitant casualness than their more robust counterparts. Take for example the specimens worn by Patrick Johnson and Tom Riley of P.Johnson Tailors. 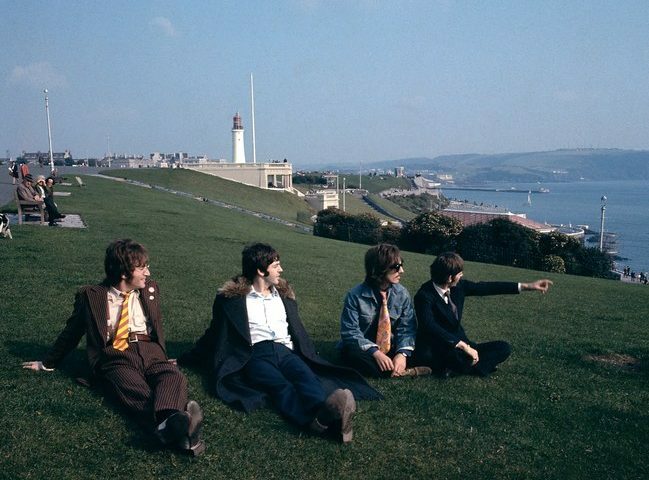 Patrick (left) maintains visual and thematic cohesion with a baby blue cotton jacket sans tie, which complements the bold orange of his sneakers. 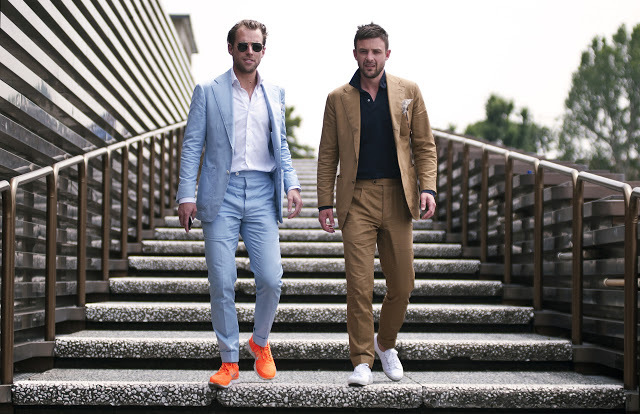 Similarly the Tobacco Neapolitan inspired cotton suit worn by Tom (right) with its soft shoulders, underscored by a dark polo, establishes a visual foundation that supports his Superga sneakers (the white sneakers which recall his linen pocketsquare is also a deftly subtle touch). In both cases neither the lines nor the designs of the suits have been compromised to accommodate the boys’s tastes for athletic footwear. Patrick Johnson (left) & Tom Riley (right) of P. Johnson Tailors. Note the short length of the trousers which help to accommodate the bulk of their sneakers. Now at this stage the ardent traditionalist may argue that it is still impossible to wear classic sneakers with a conservative worsted wool suit. Though problematic, to quote Adidas: “Impossible is Nothing”. Indeed there have been successful instances where the principles of harmony and balance have been tossed out the window. However there are only a few sartorial Zarathustras who possess the intelligence, taste and braggadocio to pull off a pair of Yeezy Red Octobers with bespoke tailoring. This should not discourage but rather encourage one’s sartorial ambitions. Shoot for the moon and you may hit the stars, as they say. However note that if your calculations are off you may find yourself floating adrift in empty sartorial space where no one can hear you scream (or where everyone else is screaming at you). 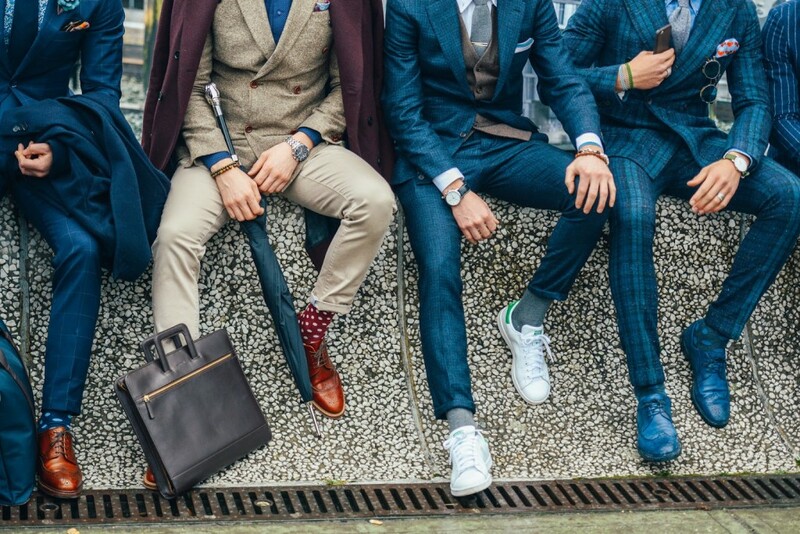 Arguably classic sneakers can be worn reliably with a classic worsted suit if a sense of carelessness is projected. Case in point, Yasuto Kamoshita, the impeccably dressed creative director of Japanese apparel chain United Arrows. In the photo below he inexplicably pulls off a worsted navy herringbone suit with a pair of Adidas by acting like it’s nothing unusual. Dressing at this rarefied level entails something of a contradiction: the more deliberate a look the less deliberate one should act. Confidence after all is not expressed through self-seriousness but rather informed indifference. Yasuto Kamoshita demonstrates the effortless je nais sais quoi needed to pull off a pair of Adidas with a conservative worsted suit. Though many traditionalists revolt at the very thought of wearing sneakers with suits I believe if the wearer considers formalist principles of harmony and balance then the aesthetic tensions between sneakers and classic suits can be alleviated. 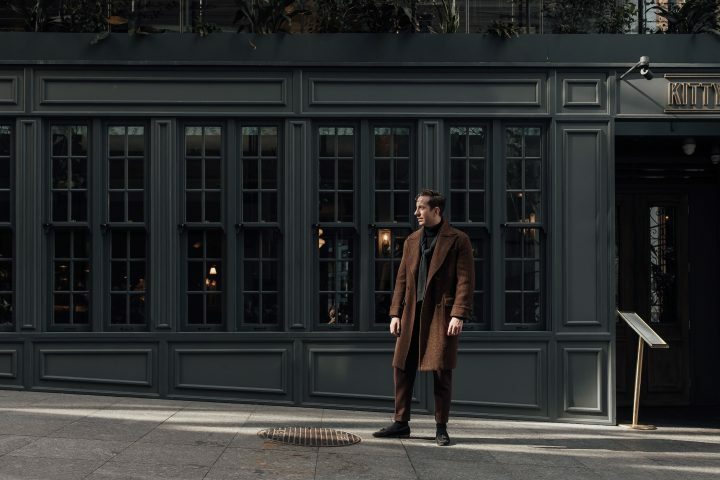 Adopting a formalist approach to style does not require us to subscribe to traditionalist pedantry but rather demands that we apply intelligence and discretion when making sartorial decisions. Convention has always been the immortal enemy of creativity and ignorance the greatest impediment to progress. It takes a thorough understanding of the rules to know how to break them and balls to step boldy into the future of sartorial style. So, go ahead and “Just do it”.